The company's plans to go private fell apart, dashing investor hopes for a buyout. Shares of Nordstrom, Inc. (NYSE:JWN) were slumping last month alongside much of the retail industry, however, there was more than just the usual fears pushing the stock down. The founding family's plans to take the company private came to an end, eliminating investors' hopes for a buyout premium. As a result, the stock gave up 16% according to S&P Global Market Intelligence. As the chart below shows, the stock slid steadily over the course of the month, but the biggest drops happened on days when news came out about the deal going south. Nordstrom shares dropped 6.4% on Oct. 2, its worst day of the month, as The New York Post reported that the intended deal was faltering. Shares of the department-store chain had spiked originally in June after the founding family said it would seek to go private, but it became difficult to find a lender for the deal. 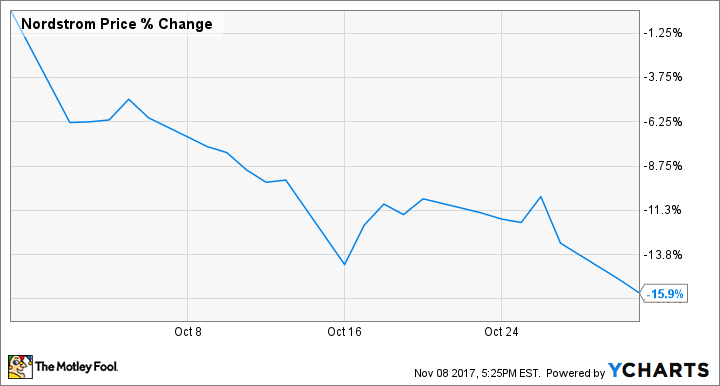 When the Nordstrom family officially called off the efforts on Oct. 16, the stock slipped again. According to Bloomberg, the interest rate sought by lenders, as much as 13%, was simply too high for the Nordstrom family. Its failure also seemed to be the result of general headwinds in the industry as lenders were reluctant to bet on the department store. Shares closed out the month on a downward trend after J.C. Penney slashed its full-year guidance, pushing other department store stocks lower. Nordstrom is set to report third-quarter earnings on Nov. 9 after the market closes, and the stock is likely to be volatile as this will be its last update before the key holiday season. Analysts see overall revenue increasing 1.4% to $3.59 billion, but see earnings per share falling from $0.84 to $0.63. While the department store sector is certainly challenged, Nordstrom is in a better position than its peers. The company posted comparable sales growth in its most recent quarter, has a thriving e-commerce business, and a promising off-price chain. Though it's become easy to dismiss all retailers, Nordstrom is still a solid business, and the stock may be entering value territory. After all, there was a reason why the family sought to take it over.